the pieces in four languages. • Playing Time: 55:57 min. 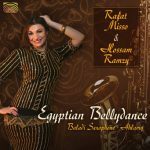 I want to thank you for Baladi Plus album, wich has trained my ears to understand and feel the egyptian flavor and their swing. Is more easy for me to learn how to play zills because I’ve learned the rhythm with you and your music!